The Le Meridien and AC Hotel complex in downtown Denver is one of the first dual-branded luxury lifestyle hotel developments in the U.S. The 272-room Meridien, and the 223-room AC offer two iconic brands under one roof, just a block from the Denver convention center. 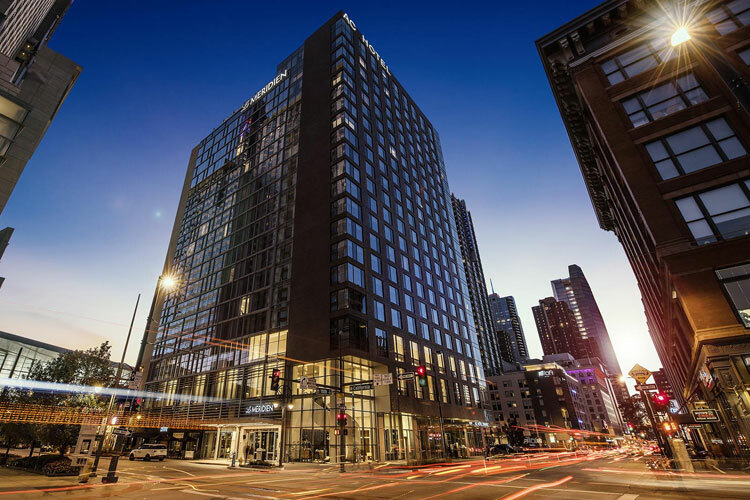 The pair of European-inspired properties mark an industry milestone as the first collaborative project from hospitality giants Marriott and Starwood since their merger. The 20-story project which opened in September 2017, is also noteworthy for its use of award-winning StoPanel Technology. Built quickly and efficiently, the project won top honors for Excellence in Construction Quality from the Association of the Walls and Ceiling Industry (AWCI) in its EIFS category. StoPanel Classic ci was the cladding selected for the new structure – using a prefabricated insulated exterior wall panel system that weighs almost 90 percent less than a precast panel of the same size. The light weight prefabricated panels are both energy efficient and durable, incorporating an insulation layer and StoGuardÒ air and moisture barrier. Prefabricating the exterior with finished panels improved quality, safety onsite, and cut the onsite construction time. In fact, the finished panels were installed in under 300 hours. Despite limited access to the construction site and a location in the heart of busy downtown Denver, the streets were kept open to traffic during this massive construction project. Precast was done three days each week and panels were installed three days each week. The panels were set in 40 days, employing a maximum crew of eight at any one time on the site.